CASEY, Dr Conerly. Hypocrisy, Spatial (In)justice and Youthful “Policing” in Northern Nigeria In: Justice et injustices spatiales [online]. Nanterre: Presses universitaires de Paris Nanterre, 2010 (generated 20 avril 2019). Available on the Internet: <http://books.openedition.org/pupo/436>. ISBN: 9782821826762. DOI: 10.4000/books.pupo.436. BRET, Bernard (ed.) ; et al. 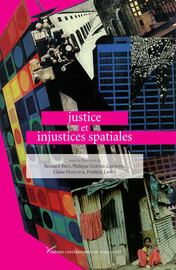 Justice et injustices spatiales. New edition [online]. Nanterre: Presses universitaires de Paris Nanterre, 2010 (generated 20 avril 2019). Available on the Internet: <http://books.openedition.org/pupo/391>. ISBN: 9782821826762. DOI: 10.4000/books.pupo.391.